Charlotte Gregory is a recent graduate of Fannie Farmer’s School of Cookery and is determined to use her education in creating appetizing, fresh, nutritious food to run her own kitchen. When she learns that women in 1910 Minnesota are not welcome in most kitchens, she enters a competition with a gas stove company to further her recognition. The gas company offers her a position traveling and lecturing on the advantages to a gas stove in the home. Charlotte finds herself drawn to the sweet tempered Lewis Mathias who acts as a performer for her lectures. However, still determined to make a difference, Charlotte approaches Dr. Joel Brooks, a young hospital superintendent she meets during her sister’s stay. Dr. Brooks considers Charlotte’s ideas about using healthier—and more expensive—hospitals meals with fine china and flowered presentations to be completely impractical. As the two are forced to work together to raise money for the hospital, they find that their stubbornness in fact reveals a spark of attraction. But soon Charlotte must choose to whom her heart belongs – to quiet but predicable Lewis or obstinate but handsome Joel. While Love Stirs is a breezy, simple read. The plot moves quickly and while it can be read easily, it is also quite rushed at times. Charlotte is a strong female, independent and determined to fight for what she believes is right. Joel is frustrating in his inability to see the positive points of Charlotte’s arguments and does not encourage affection from the reader. The novel is very dramatic. Every slightly inconvenient event is turned into a significant problem; however, the issue is resolved so quickly the reader feels disconnected and left behind. The “fighting” between Charlotte and Joel is especially forced. Nevertheless, the overall themes of the book are enjoyable. Charlotte’s cooking creations sound delightful and her desire to help others through her cooking is admirable. The author’s knowledge of various history subjects is commendable and interesting to read. Overall, the novel is recommended. Sarah Cooley moves home to Last Chance, New Mexico, after college to teach at the local elementary school and be closer to her family. She likes the small town because of its predictability and resistance to change. After struggling with a relationship in which her boyfriend wanted to adjust everything about her, Sarah is ready for the lazy and almost boring pace of Last Chance. But Chris Reed, the new owner of the diner in town, wants nothing more than to shake things up in Sarah’s small town. He desires to put Last Chance as a destination spot on the map and thinks a transformation is just what is needed to draw people to his restaurant. When his niece comes for an extended visit, however, he discovers that change may be where he least expects it. As he finds himself spending more time with Sarah, he encourages her to realize that change must be just the thing needed for both of them. One More Last Chance is a light read, the pages breezing by with stories of traditions and transformations. The characters are mostly likable and simplistic; although Sarah seems judgmental, arrogant, and rude at first, she somewhat redeems herself with her love for her students and teaching. Chris is gentle and patient in his care for his niece and becomes a good friend to Sarah. The novel is short and would have been a better read if there had been more descriptions of the scenes to help the reader more fully envision all that Last Chance had to offer. Many of the dialogues and events in the book feel rushed and hurried, which makes it a little hard to connect with the characters. However, the overall themes and plot of the novel are enjoyable and it is recommended for those looking for a contemporary, easy read. Wynter Evans has never escaped the pain of losing her little brother to abduction nine years ago. As a news reporter, she believes in hunting clues until she finds answers, so when she stumbles upon a picture of a young man resembling her brother, she immediately sets out for a small, rural town to dig deeper. Dragging along the photographer for the news station, Zac, Wynter arrives in Sanctuary determined to find answers. What she discovers instead is suspicious activities and mysterious behaviors of the conservative residents. With the help of the handsome young mayor, Rueben King, Wynter uncovers secrets about her family and her past that changes everything. Wynter is resolute in her decision to find the truth but someone else is equally determined to keep it in the shadows, even at the expense of Wynter’s very life. Gathering Shadows has heart-pounding action from page one. Ms. Mehl possesses an excellent writing style that allows the novel to flow quickly while also incorporating an admirable amount of detail. The main characters are likable and slightly mysterious, adding to the thrill of the plot. The events of the book all link together in a creative fashion and the novel is not predictable or boring in any sense. Twists and turns throughout the book provide significant depth to the plot as the reader navigates through the intriguing journey with the heroine. Suspenseful and delightful, this novel is highly enjoyable and greatly recommended. In a sudden turn of events, Emily Hunt’s relatively quiet life as a schoolteacher is turned upside down. Although she comes from a family of cops, she deliberately avoids anything that has to do with drug cartels, murder, or danger. When those very things are brought to her classroom one morning, she needs to draw on all her inner courage and learn to depend on none other than Mason Taylor, the man accused of being involved in her brother’s murder. Mason knows Emily is struggling to trust him, but he also recognizes that she cares for her students. When one of the students becomes involved with a drug cartel, Mason turns to Emily for help. Neither of them suspect what will happen next nor how dangerous their involvement will suddenly become. They must rely on each other to solve the mystery of events before it is too late. Fatal Exchange is a fast-paced, exciting novel. Almost the entire story takes place during one action-packed day and just when one danger begins to fade, another one is ready to cause more turmoil. Ms. Harris’s characters are relatively complex and the hint of romance introduced provides a nice balance to the evils lurking among the pages. Some of the ending plot points felt rushed and disjointed, which detracted from the earlier flow of the novel. Although this story could stand alone, reading the entire series gives a better understanding of each of the characters. A short introduction to one particular individual at the end suggests that the next novel will also be worth reading. Overall, the book is a thrilling, romantic novel recommend for lovers of contemporary suspense. Claire Summers works hard to balance her job as an elementary school teacher and her role as a single mother to her eleven year old daughter, Haley. With her free time, she does handyman jobs around their crumbling house to save money. After a bad marriage, she has sworn off men for a while… until her daughter writes a letter to a local philanthropic businessman and changes everything. Keith Watson spends longs hours in the office working for his kind boss, which leaves little time for social activities. When Keith stumbles upon Haley’s letter asking for help locating the son her neighbor gave up for adoption years ago, he dismisses it as childish fantasy. But his boss has other ideas and pushes Keith to take on this task. As Keith reluctantly digs into the past, he realizes he has his own demons to face. Claire and Keith find their lives intertwining one spring in ways they never expected, as one little girl’s kindhearted request touches several lives and leads to surprising endings. 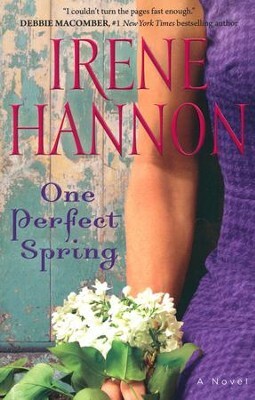 This contemporary romance novel has predictable parts, but Irene Hannon also includes unexpected plot twists that keep the story interesting. The characters are all struggling with varying issues, whether it is regret for past mistakes, lingering and debilitating sickness, buried pain and abuse, or forgiveness for others’ wrongs, which allow parts of the novel to be realistic and identifiable. Ms. Hannon does a nice job of intertwining the stories of the various characters, allowing each to find healing through their interactions with each other. The book elicits both smiles and emotional reactions, allowing the reader to enjoy a novel that is not surface-based but has deeper concepts and communications. The writing style is simple but the book flows well and is easy to read. Overall, it is an enjoyable story, although some of the histories of the characters have much too convenient similarities and at times, the plot slows a bit. Nevertheless, this novel is a good contemporary story and is recommended for those who wish to read an interesting romance.